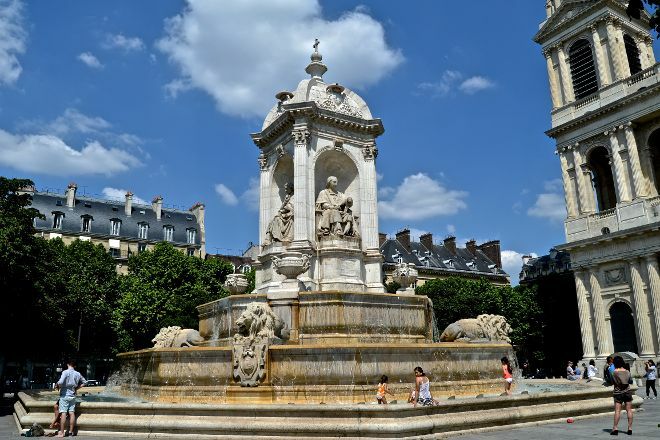 Also known as the Fontaine de la place Saint-Sulpice or as the Fontaine des Orateurs-Sacré, Fontaine Saint-Sulpice is a monumental fountain you can find located in Place Saint-Sulpice. It was constructed between 1843 and 1848 by the architect Louis Visconti, who also designed the tomb of Napoleon. Four figures stand prominent on the fountain and represent four French religious figures of the 17th century famous for their eloquence, including Bossuet, Fénelon, Fléchier, and Massillon. The fountain was criticized when it opened, because of the incoherence of the iconography and details. One critic noted that the vases pouring water were "veritable cooking pots." Describing the lions, another critic wrote that "everything about them shows their irritation at the water pouring onto their rear ends." Upon visiting this large, impressive fountain, you can decide for yourself just how magnificent the landmark is. Plan to visit Fontaine Saint-Sulpice during your Paris vacation using our convenient Paris sightseeing site . This Wonderful fountain is right in front of the beautiful Saint Sulpice Church. It's monumental water spurts intermittently. It is Also known as the Source of the 4 cardinal points. I Visited this church and the fountain walking through the Latin Quarter, on the way to the Luxembourg Gardens. There are many surprises in this region. This is a beautiful fountain in front of Saint-Sulpice church. It is a place that can settle down because there are not so many people around. Overshadowed by the Church of Saint Sulpice is this fountain right outside of its frontage. I went early morning and the square was peaceful and serene. Just a few birds chirping and locals enjoying quiet moments on the benches. The fountain wasn't on but surprisingly the water is quite clean for a public fountain. Make sure you make a pit stop when visiting Saint Sulpice. An attractive fountain called the Fountain of the Four Bishops can be found at Place St. Sulpice near the edge of the St. Germain and Luxemburg districts. It is worth a quick stop if you intend to spend time in the Luxemburg district or if you are purposely seeking to visit the Church of St. Sulpice during your trip to Paris. This fountain was built by Joachim Visconti between 1844 and 1848 and features statues of past bishops on each side of the fountain. These include Bishop Jacques-Bénigne Bossuet (North), Bishop Esprit Fléchier (East), Bishop Jean-Baptiste Massillon (South) and Bishop François Fénelon (West). The Fountain of the Four Bishops is quite nice to see in the warmer months of the year. However, during winter, the fountain is turned off, emptied of water and the trees, which line the square are devoid of leaves, making this a less appealing attraction and area to spend time during this part of the year.